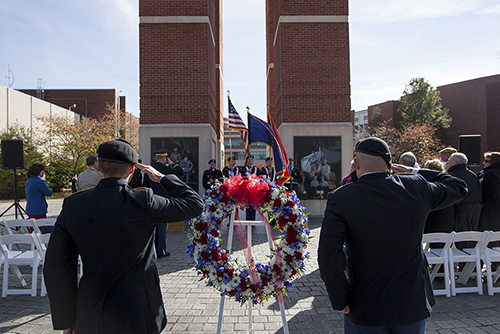 The Veterans Day ceremony will include the unveiling of a new panel on the Guthrie Bell Tower in honor of the 100th anniversary of the WKU ROTC Program, as well as feature remarks from U.S. Rep. Brett Guthrie, Lt. Gov. Jenean Hampton and WKU President Timothy C. Caboni. The ROTC Hall of Fame Induction will begin at 11:30 a.m. in the Jack and Jackie Harbaugh Club at Houchens Industries-L.T. Smith Stadium. The 2018 ROTC Hall of Fame inductee is LTC Michael R. Kenney, a 1964 graduate who retired from the U.S. Army in 1990. Michael R. Kenney earned his Bachelor of Science Degree from WKU and commissioned as a Second Lieutenant in August 1964. He later earned his Master’s Degree in Personnel Management from Webster University, Kansas City, Kansas, in 1980. After completing Helicopter Flight School in 1966, LTC Kenney’s first assignment was the 11th Armored Cavalry Regiment. In August 1966, he deployed to Vietnam where he flew six months of combat, combat support and Medevac missions. In January 1967, he started his next assignment with 121st Aviation Company at Soc Trang, Vietnam, where he supported the Vietnamese Army and flew over 1,000 combat and combat support hours in his first year. From 1967 to 1969, LTC Kenney was a flight instructor at the Primary Helicopter School, Fort Wolters, Texas. In 1970, he returned to Vietnam flying fixed wing intelligence collection missions and served as Pilot and Missions Ops Officer for 224th Aviation Battalion RR, collecting tactical and strategic intelligence. From 1972-1974, LTC Kenney served as the S-2 for 158th Avn Bn, 101st Airborne Division. LTC Kenney’s next assignment was Helemano, Hawaii, where he commanded 372nd Army Security Agency Company that deployed units to Korea, the Big Island of Hawaii, and Oahu. He next served in G3, 25th Division, as Electronic Warfare Officer. After completing Attaché Training in 1981, LTC Kenney served as an Army Attaché and Pilot to the US Embassy in Kinshasa, Zaire. He received diplomatic accreditation with eight central African countries, and, in 1983, he was the Sub-Saharan Africa desk officer at the Defense Intelligence Agency. In 1984, he was the U.S. Military Liaison Officer to Namibia where he worked closely with the South African Military and Police on terrorist operations and an infrastructure project. In 1987, LTC Kenney was Defense Attaché and pilot to the U.S. Embassy in Khartoum, Sudan. After returning to the U.S, LTC Kenney worked for Gen. Norman Schwarzkopf at J-5, U.S. Central Command, MacDill, AFB, Tampa, Florida. LTC Kenney retired from Active Duty in June 1990 with 27 years of Service. LTC Kenney’s military awards and decorations include the Legion of Merit, Defense Superior Service Medal, Distinguished Flying Cross (2), Bronze Star (2), Air Medal with “V”, Air Medal (10), Joint Service Commendation Medal, Joint Meritorious Unit Award, Army Commendation Medal, National Defense Service Medal, Vietnam Service Medal, Vietnam Campaign Medal, Republic of Vietnam Cross of Gallantry with Palm, Senior Aviator Badge, Overseas Service Ribbon (3), Army Service Ribbon. LTC Kenney and his wife of 54 years reside in Bowling Green. He continues to serve the military, his church and the community. Because LTC Kenney had played baseball as a student at WKU, the WKU Alumni “W” Club elected him President after his return to Bowling Green in 1993. LTC Kenney initiated a scholarship to honor David Mackey, a fallen classmate from the Vietnam War, and recognize a distinguished military student at WKU every year.